MONDAY, Feb. 13, 2017 (HealthDay News) -- It's still flu season, and not too late to get your flu shot. But a new study suggests that people with eczema should request the vaccine be given into the muscle, rather than just under the skin. That's because the effectiveness of flu shots in people with eczema appears to vary, depending on how it's given, researchers report. The problem seems to lie with the fact that the cracked, dry skin of eczema patients is often colonized by Staphylococcus bacteria. And that seems to dampen the immune response from the flu vaccine -- if the shot is given into the skin, the researchers said. "Staphylococcus infections are a widespread problem among [eczema] patients, with up to 90 percent of patients with severe disease colonized by the bacteria," lead researcher Dr. Donald Leung, of National Jewish Health in Denver, said in a hospital news release. He's head of pediatric allergy and immunology at the medical center. Leung's team believes that people with eczema "are likely to get the most protection from traditional intramuscular influenza vaccines, rather than intradermal vaccines." Eczema is the most common chronic skin disease in the United States, affecting more than 15 percent of children. The condition persists into adulthood for about half of them. As the researchers explained, intradermal (into the skin) flu vaccines were first approved for use in U.S. adults in 2011. 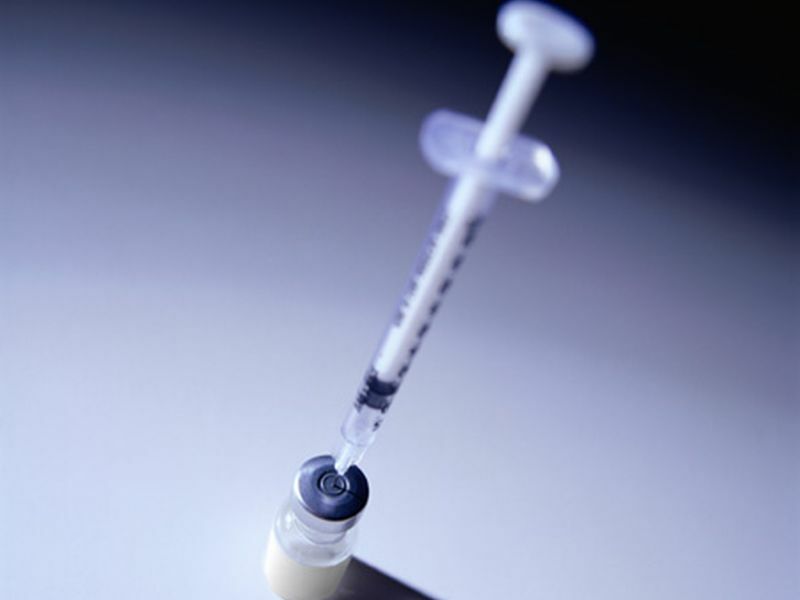 Needle-phobics no doubt prefer them, because they involve smaller needles that penetrate less deeply and, "use significantly less material to achieve similar immunologic effects in most people," according to the news release. But Leung's team wondered if intradermal shots would be as effective in people with eczema. So, the researchers tracked immune responses for 202 people with eczema and 136 people without the skin condition. About half of the study participants got an intradermal flu vaccine, while the other half received the intramuscular shot. The result: About a month later, only 11 percent of those who received an injection in the skin had developed protection against the strain of flu targeted by the vaccine, compared with 47 percent of those who received an injection into the muscle. Leung's team note that skin swabs taken from 42 percent of participants also tested positive for staph bacteria. The researchers said it's not yet clear if the presence of the bacteria was the cause of the lower flu immunization rate for those who got the intradermal shot. However, the researchers pointed to prior studies that have shown that colonization of the skin by staph infections can cause immune cells to "retreat" from the skin. Staph bacteria also produce toxins that typically inhibit the activity of certain immune-system cells, the study authors explained. Dr. Nika Finelt is a dermatologist at Northwell Health in Manhasset, N.Y. She called the study "important," highlighting the need for special care when immunizing people with eczema. Dr. Leonard Krilov, chair of pediatrics at Winthrop-University Hospital in Mineola, N.Y., agreed. He also believes the study highlights why children with eczema, especially, should get the flu shot. "This emphasizes potential immune weakness in children with eczema, which could also put them at risk for more severe illness from influenza," Krilov said. "Thus, these individuals should be targeted to receive influenza vaccine." The study was published online Feb. 13 in the Journal of Allergy and Clinical Immunology. What is eczema (atopic dermatitis)? Is eczema contagious? What causes eczema? What does eczema look like? Learn about home remedies for eczema, how to treat eczema, and how to get rid of eczema.